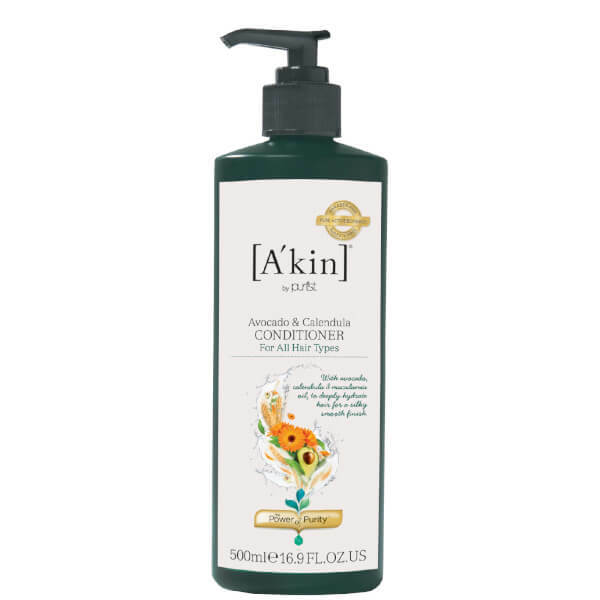 Deeply hydrate hair from root to tip with the A'kin Avocado and Calendula Conditioner; a lightweight, nourishing formula that works to restore healthy, luscious locks. Enriched with Macadamia, Calendula Extract and certified organic Avocado Oil, the conditioner saturates long, dry hair with intense moisture, leaving it soft, smooth and naturally beautiful. Aqua (Water), Glycerin, Cetearyl Alcohol, Behentrimonium Methosulfate, Hydrolyzed Wheat Protein, Macadamia Ternifolia Seed Oil, Persea Gratissima (Avocado) Oil, Simmondsia Chinensis (jojoba) Seed Oil, Lecithin, Glyceryl Laurate, Sodium Gluconate, Potassium Sorbate, Citric Acid, Pelargonium Graveolens (Geranium) Flower Oil, Glycine Soja (Soybean) Oil, Pogostemon Cablin (Patchouli) Oil, Eugenia Caryophyllus (Clove) Leaf Oil, Elettaria Cardamomum Seed Oil, Calendula Officinalis Flower Extract, Tocopherol, Ascorbyl Palmitate, Hydrogenated Palm Glycerides Citrate, Citronellol, Geraniol.